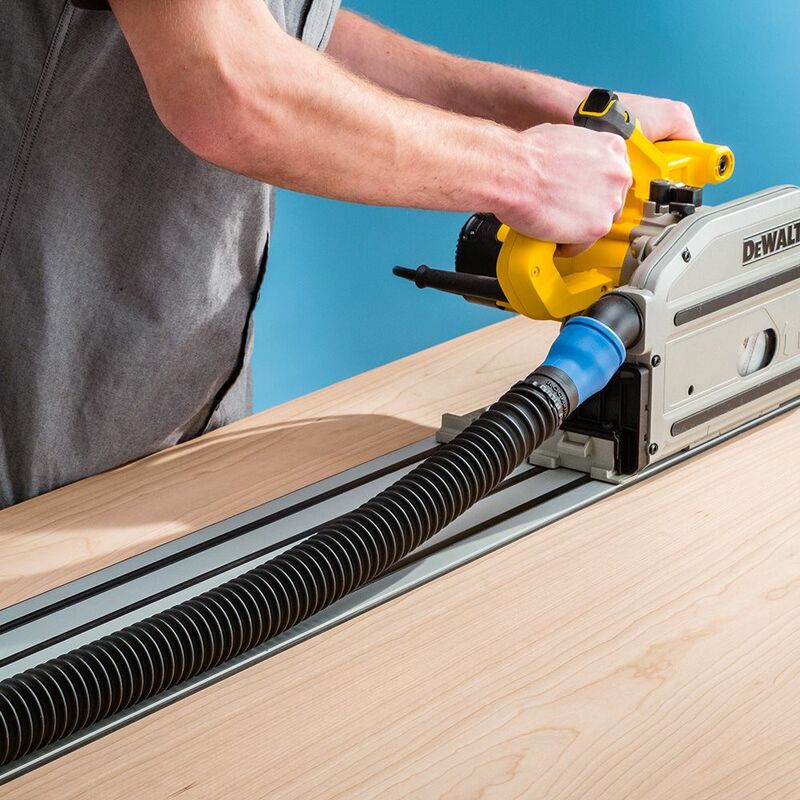 Incredible expanding hose with flexible ports lets you use dust collection with nearly any handheld power tool. Handheld power tools generate a lot of dust right where you least want it: directly under your nose. 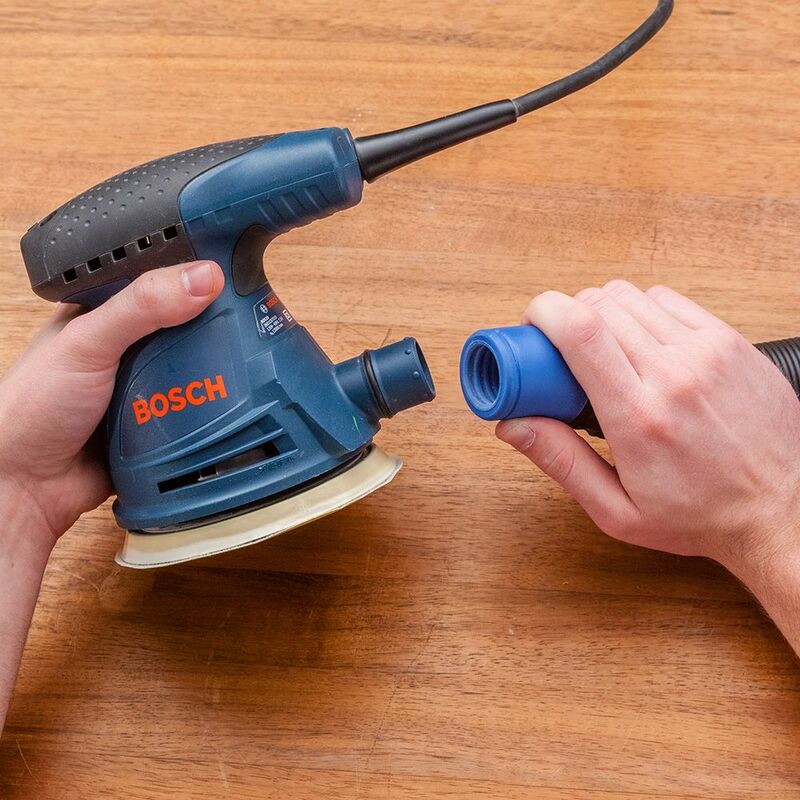 Unfortunately, the confusing array of non-standardized dust ports on handheld tools makes it hard to connect a dust hose—until now. 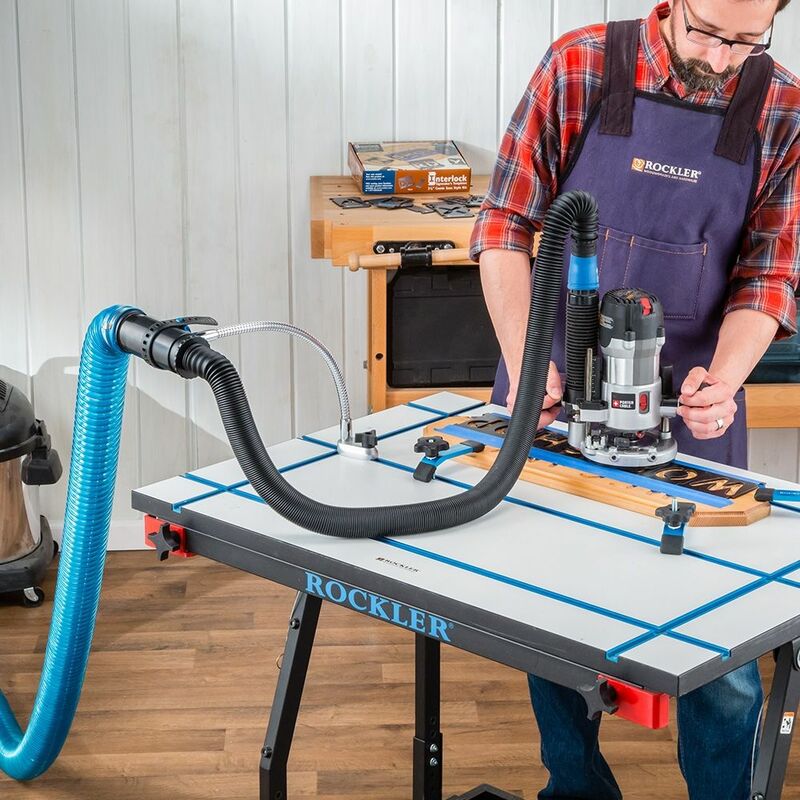 This new kit from Rockler includes two sizes of flexible rubber dust ports—1'', 1-1/2'' ID —that flex to fit on almost any tool, plus a 2-1/4'' port that connects to most shop vacuums, dust separators or our optional Cord and Hose Holder (#47321, sold separately). The two tool-end ports are thoughtfully designed with a slight elbow that helps lift the dust hose off of your work. All ports thread securely into the included premium ''stretch'' hose, which is a remarkable engineering feat in itself. 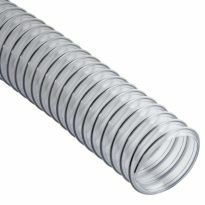 This supple, agile hose expands from a mere 3' to nearly 15' long, and is a pleasure to work with, providing almost zero resistance as you move about your workspace. These fit almost all my tools and work great! My belt sander is an odd ball though. I can clean its bag with these and NOT miss a grain of dust. Also bought the two auxiliary ports and have hooked it up to every tool I've tried so far. Great Product. Used a piece of 2-1/4" ID hose to attach the Dust right coupler to the end of my existing vac hose. Dust right universal Small port hose kit! The long hose makes it very adaptable! Works as intended and gets most of the dust. I had no problems with it fitting on a shop vac. Takes up very little space when not being used. This is just what I needed. Used it the other day with my orbital sanded, it worked great. Looking forward to using it again. Works great except the hose has too much flexibility and you have to fight it a little when using hand held tools. 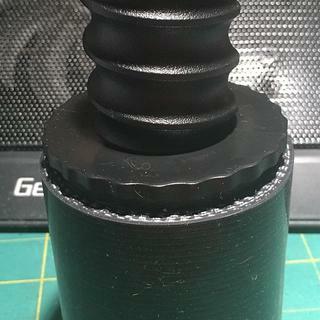 Hose adapter fit my Ryobi miter saw to connect to my shop vac. Quality was better than expected. Looks very durable. It was the only part I could find that would fit my DW 745 and my rigid Wet/Vac system. So far really liking this product, but may have to upgrade my dust collection behind this product. I needed these things to hook my scroll saw up to my dust collector.Works great. Would recommend this item, very happy with it was everything that was stated in add. Used this with the 2 1/2 inch expanding hose for the first time in my shop with the new table saw. Worked perfectly. No need to clean up afterward. Also moved it over to the hand held sander (Dewalt) with no visible dust on the work or the table. The product fit the bill as promised. All parts fit my various equipment. It should make for a cleaner and safer shop. This is just what I was looking for to connect to my palm sander. Perfect fit. Now I can connect my ship vac to every power tool I use. The expandable hose works perfectly and the larger nozzle fits perfectly on my orbital sander. I only wish someone made something similar for older Craftsman belt sanders with the rectangular slot for a vacuum attachment. Thanks Rockler for offering this universal system. Fits all my sanders, works perfectly. Works great with a Festool track saw. I bought this mainly for a dust collection fitting, for my Festool track saw. It fit perfectly. I haven't found a use for the other yet, but I haven't tried very hard to either. Heavy duty materials with nice screw in joints make for strong connections. The hubs worked nicely on my tools. So far so good, it’s doing everything I need it to. In the near future I will be mounting it up above my sanding station, hose can be a bit cumbersome at time, but like I said it performs perfectly. Working to contain as must dust at its source. The small port hose kit has really helped reaching that goal. If I don't use it sometimes I'm just lazy. Get one and keep that dust out of your lungs. This has become a most useful hose. Fits every tool I have, and attaches to a large size portable vac. I’m pleased with the purchase. It works well with my vacuum system. Works great with my dust collector and tools! Works great. Bought it for small CNC router and I have plenty of hose to suspend above the router for free movement. 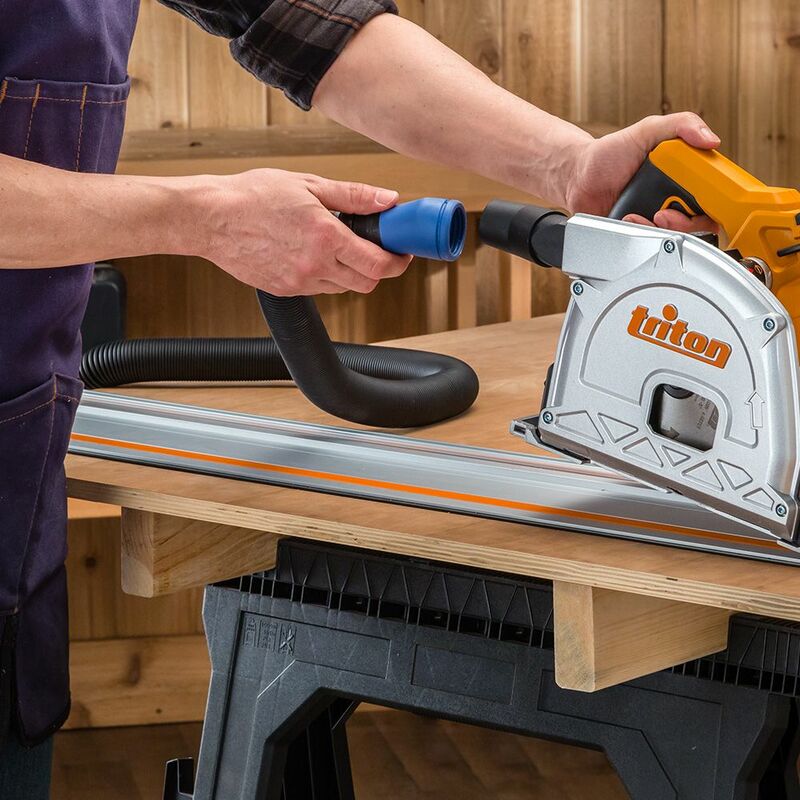 Fits perfect for other small applications like the handheld router, palm sanders, and biscuit jointer. I used this kit to connect to a small handheld circular saw. It works really well in capturing sawdust. hooked up the hose and ports to my various power tools and it really sucked in a good way. It worked perfectly and helped eliminate most of the dust and chips keeping it out of the air and off the work surface. Dust collection done right. EXCEEDS EXPECTATIONS! It doesn’t take long trying dust collection attachments before you find out that dust is the easiest thing to address. After that, it’s finding attachment kits that not only remove dust effectively, but also don’t impede on your work process ie. “get in the way”. This kit gets EVERYTHING right. Fittings are great. 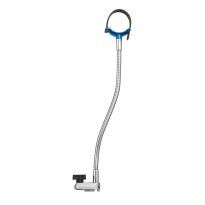 The hose is perfect because it’s tangle-proof with the swivel fittings. It’s snakes behind your cuts, turns and doesn’t give resistance. This is so important working with routers and other smaller cutting tools. This seems to be good quality. 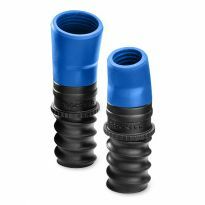 The hose is very flexible and supple, and I think it'll last longer than the hose that comes with Rockler's base-level dust separator. This hose expanded so long I was able to cut it in half and use it for two stations. Hooking up to 2-1/2” blast gates was pretty easy thanks to YouTube University, pvc pipe, and a heat gun. Now I can hook up to everything and even use different hose accessories to clean up the bench top and surrounding areas. P.S.-I don’t work for Rockler. I have many older tools and this kit is helping to access the dust ports on those old tools. Seems to work OK and I have no complaints so far. It's just nice someone has finally addressed this problem and I don't have to apply duct tape to every connection now and then clean it off after leaving it on too long. Thanks Dust Right! If it works, it's a godsend. I needed a smaller connection for sanders and my router. I was looking thru the magazine and I said wow this is just what I need it's ideal for a small shop, Thanks. Great product for my 30 years of hand tools that have all different ports. Have multiple small tools that need to be attached to a vac. needed something that fits everything small so that I do not have to worry about fittings for each tool. Tired of using a car detailing kit and hose clamp on the palm sander and other various small tools. To fit small things like orbital sander, hand planner and items like these. Have one of these now and it works awesome. My tools have different size ports. Some of my tools have square exit ports, appears these will fit over them. For my track saw and sander. 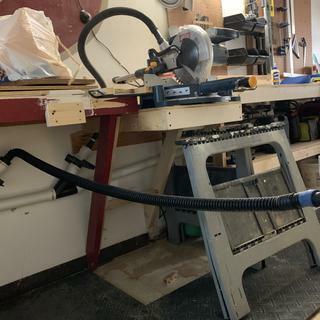 My newest orbital sander does not offer an adapter for connecting standard hoses and this will solve that problem plus I like the idea of the lighter hose. I have tried several hose connectors and none were very useful. I hope this works. I’ll write back when I receive it. Hoping it'll fit my Festool track saw and other power hand tools. I plan to use this for my compound miter saw and several sanders and routers. Vacuum ports are a headache. This seems like a great idea. Need a longer hose for shop vac. I needed them . . . .at least that's what I told my wife! Needed for my small power tools. I've already purchased one for a few tools, worked great, plan to add to other tools. I am tired of making duck tape connections. Needed a good option for my random orbital sander. Recommended by a friend as being flexible enough for my needs. Have one kit, and small port adapters fit many things. When I use 2 sanders (oscillating circular and square for inside corners), it's too time consuming to switch the small ports on the hose end through multiple finish grades. With a 2nd kit, I can leave one attached to each sander, and change it at the vacuum port end. Found these on sale. Additions to other set. Savings helped ridiculous freight charges to AK. I purchased the larger version of this for my work and it is very easy to use. So I decided to upgrade my home setup. I need to Connect my Dust Right Universal Small port hose to the end of this Dust Right shopvac hose but don't see a connector? BEST ANSWER: I bought this hose to do the same thing today. The universal ends will friction fit into the blue hose but won’t thread. They are too small. The fit is ok but you will probably need to add some tape to make it thick enough to hold. On a side note, the small end that comes with the blue hose has a rubber tip and actually fits snuggly on all of the tools I’ve tried so far. So I may just use it and skip using the universal end. The adapters screw into the hose. 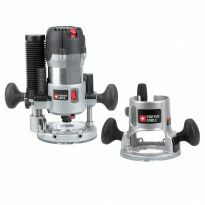 Has anyone tried this set with a Mirka CEROS sander? Will anything fit? BEST ANSWER: The small green festool hose fits it perfect. 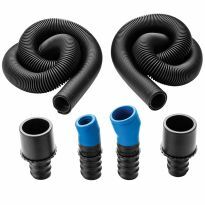 Does this set fit the 1 - 1/2'' hoze included in the Dust Right® Universal Small Port Hose Kit (Item #48212) ? BEST ANSWER: Yes, 48212 will fit onto the wand ends of this kit. No, it will not fit. Are individual components of Dust Right® Universal Small Port Hose Kit Item #: 48212 available for purchase, separately? BEST ANSWER: The 3 ports are available together for $19.99 plus handling through our customer care team at 800-376-7856 by requesting item #56413. I sent a message to customer support regarding the item number and was advised that this part cannot be ordered and is only for the warehouse just in case they need to send parts to customers??? #56413 does NOT come up in any search results. Could you please post the - correct - part number? How do I connect my Dust Right Universal Small Hose Kit to my 4" system? I purchased the Small Hose Kit to connect up to my Dewalt Drop Saw to my Jet Dust Extraction, but am missing a connector to get from the 2 1/4 OD of the Small Hose Kit to the 4" on the Jet, or even the Quick Change Handle. Any advice greatly appreciated. Will this fit my DW621 dust port? Will these hose adapters fit the non standard Triton MOF001 router dust port? BEST ANSWER: They will fit anything with a little force and a couple zip ties. 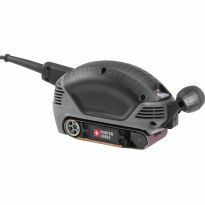 I would like to use this sander with Rocker's new universal small port hose kit. Are they compatible with each other? 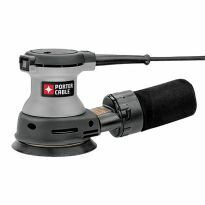 I have an older version of the same Porter Cable sander and the Dust Right hose. The hose fits but the connection is loose. I find myself sanding with one hand and holding the hose to the tool (so it doesn't slip off) with the other. A small automotive hose clamp should keep everything tight, I just need to get to the store. will your hose connect with a festool CT36 ? Instead of using a shop vac, can I use a reducer on my 4 inch dust collector? "The 2-1/2'' ports are also compatible with our Universal Small Port Hose Kit". Can you clarify how? I would love to connect two of my 1.5" hoses to this. 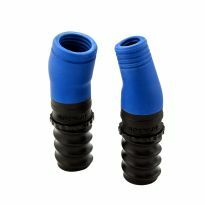 Can this hose be used for wet pickup? If you are using a wet/dry vacuum, I don't see why not. 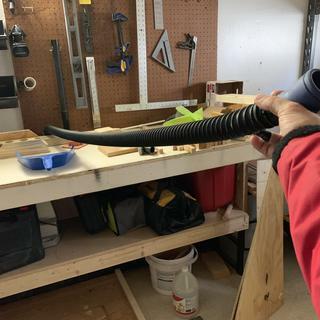 I use the Dust Deputy with my shop vac, so I generally have a collection of sawdust in the first bucket and adding water would make a huge mess, so I would not do it without re-attaching straight to the shop vac. The materials are plastic and rubber so the hose and fittings are waterproof. Please note that the hose is corrugated on the inside so completely drying the hose afterwards would involve keeping the hose stretched full length so as not to trap residual water. Not according to product info as provided by Rockler John. Great for a variety of dust emitting tools, luv it. I don't see anything about these attachments that would be harmed in a wet pickup situation. 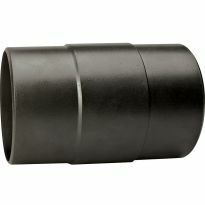 Will this fit the Triton plunge routers with a built in 38mm (1-1/2") dust port I.D.? 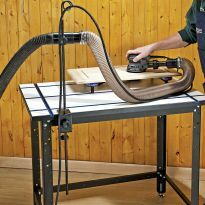 BEST ANSWER: Richard, after looking at the Triton plunge router, the dust collection hose fits into the guard. So, without attaching the dust ports and just using the hose end, it may work. If, not, you may have to find a piece of, say PVC, that will have an 1-1/2" O.D. 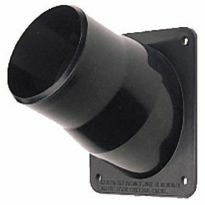 then you can use the 1-1/2" swiveling dust port. Worth a try if nothing else has worked. Will this connect to my Fein shop vac? BEST ANSWER: It fits my Fein Turbo II perfectly. It works quite well with a Fein, either (as Fred says) plugging the included shop-vac adapter directly into the vacuum, or (as Robert says) by fitting the end of the Fein hose directly into the universal hose, a perfect stretch fit. I have a Fein 2. I use it exclusively with my Fein Shop Vac. 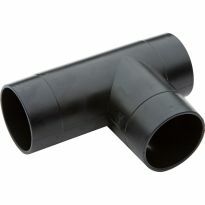 Fein Vacs have a standard size inlet hole so any standard shop vac hose will fit. I was able to use it on mine by simply stretching the hose over the Fein adapter. If the inlet on the shop vac is 2 1/4 inches it should fit. Will it fit a dust deputy? BEST ANSWER: Out of the box this does not fit a Dust Deputy. The ID of the 2-1/4" swiveling port is 1-3/4" and the OD of the Dust Deputy inlet port at the tip is 1-7/8". However the wall thickness of the of 2-1/4" swiveling port is 3/16" . After a little quality time with a drum sander and a knife I was able to enlarge the ID if the swiveling port to a little under 2"and now IT FITS GREAT. Nope it does not fit the Dust Deputy . The reason i bought this was to use my Bosch and festool gear with hoses that fit probably and to connect them to y Dust Deputy. they don't fit I sent it back for a refund. Why they didn't think the design thru more carefully is beyond me. 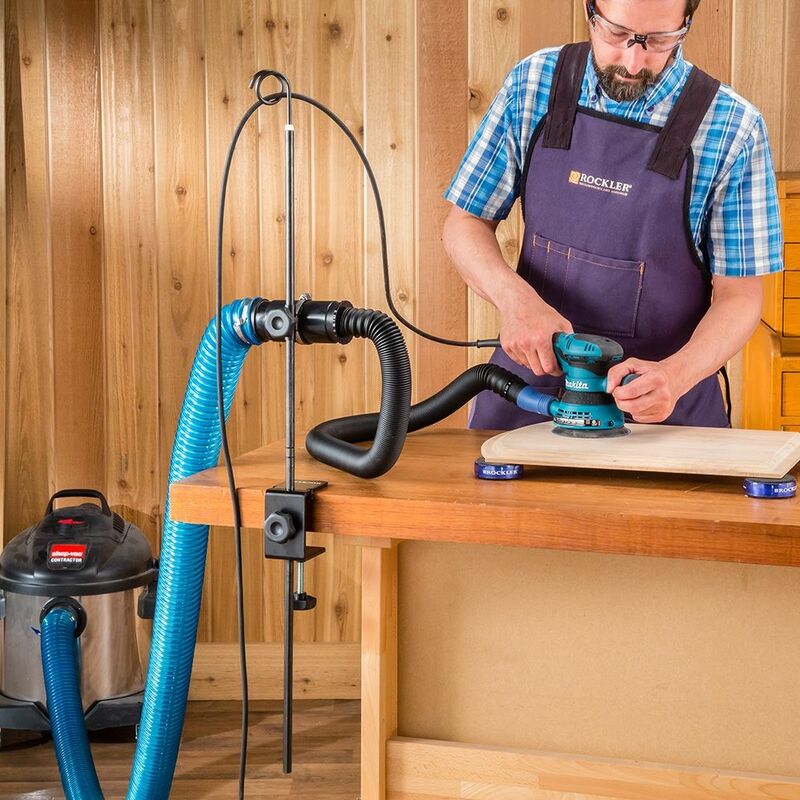 using your regular shop vac or craftsman version for dust collection is not very smart. We build acoustic guitars and create a lot of very very fine dust. Your filter in a regular shop vac gets clogged up in minutes. The dust deputy is the best thing for a small shop to control health damaging dust. I would not recommend this to anyone. until Rockler makes improvements to use it with REAL dust collection systems. It doesn't fit my Dust Deputy directly. Fortunately I had a 2 1/4" to 2 1/4" ID adapter laying around. It connects to the swivel port from the Universal Small Port hose which then connects into the end of the hose already coming out of my Dust Deputy. I haven't fired it up yet but don't see why it won't work. I hope so. I used my own 2.25" hose for the pick-up on my Dust Deputy & I am going to check it this week-end (Memorial Day) I've been extra busy at my day job that I've not had a chance to even open the box. But I am sure it will do the trick. The vacuum adapter will not fit a Dust Deputy nor will the hose by itself. I use mine on a Fein Turbo II Dust collector when using hand sanders. I use my dust Deputy with my Fein for my 6" x 48" belt sander. What adapters are needed to make this work with the 4" Dust Right system? BEST ANSWER: No adapters needed if you already have dust right pieces. It's all made to fit together and works well. Do you sell an additional 2 1/4 OD swiveling port? I need one on each end for my random orbiting sander. BEST ANSWER: The swiveling hose end that connects to the shop vac is 2.25" OD. Will the adapter ends screw into a standard Festool anti-static hose? 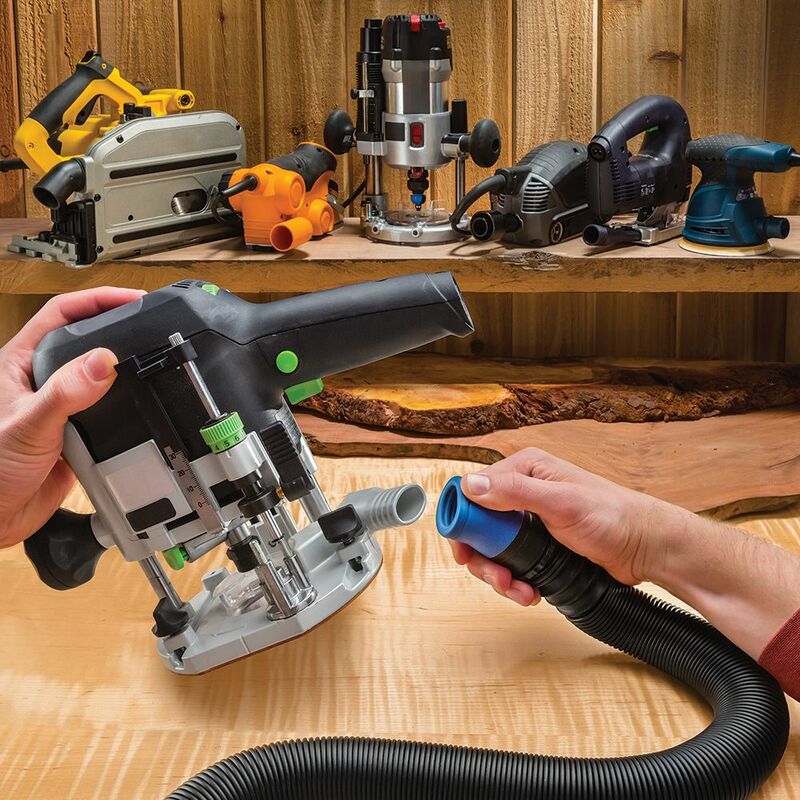 BEST ANSWER: I have the Festool Dust extractor and the Rockler Product you are asking about. The short answer is that the screw adapter ends do not fit onto the end of the anti stat tubing I received with my Festool Dust Extractor. However the black antistat tubing provided with the Rockler product does fit nicely over the connection at the end of my Festool Dust extractor hose. It makes a very tight connection. It would mean that you would have to use both hoses, the Festool and Rockler, but it works very well. I own Festool random orbital sander and the new adapters from Rockler fit it perfectly. A very tight fit. 2 1/4 od swiveling port do you sell individual? Will this fit my Makita BO5014k random orbit sander? BEST ANSWER: I bought it specifically for my Makita random orbit sander, and it does not fit the hose adapter. Will this fit the Shopsmith 3300 vacuum system? BEST ANSWER: Yes, I attached this hose kit to my Shopsmith 3300. It will plug directly into the vacuum or thru a std hose coupler. Will this fit a Ridgid 5" random ordit sander? BEST ANSWER: Since your sander has a 1 1/4" vacuum port, it should fit, loosely. So you may have to build up the port on your sander for it to fit more snuggly. I have the 1 1/2" dust port on my Craftsman Belt & Disk sander and it works well, as the port is smaller than the 1 1/2" and it fits loose but does work. I do enjoy this product and it has come in handy. Hope this helps. It should fit. Mostly all sanders have compatible ports/openings. To be sure, remove the dust bag/collector from the sander and measure the diameter(s) of the ports/openings. Then check if your size is listed among the hose attachments. If the dust port on your sander is either 1" or 1.5" in diameter, then yes it will. Will this fit my Bosch miter saw dust port? BEST ANSWER: It did not fit my Porter Cable random sander, but duct tape saved the purchase. Seems Impossible get a straight answer on if this kit will properly interface with the Triton Routers.... what gives? Rockler sells both products, seems like there would be less uncertainty about this obvious question. 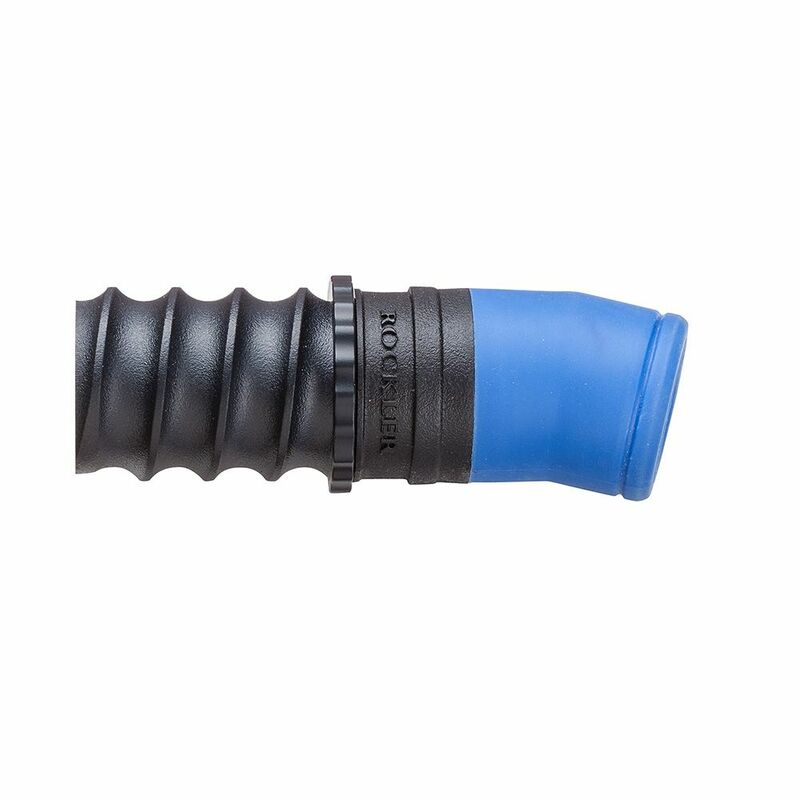 BEST ANSWER: Even though the OD of the blue portion of the hose is about 37.5mm and the opening on the router is 38mm, the threads on the inlet stop the blue piece at less than 1.2" in. So it would not be totally secure unless you added a 3D printed part or a piece of tape wrapped around the hose. I have 4 routers and use it this kit on all of them. But I have pieces from vacs I have owned over the years and got real good a rigging stuff to make it work. 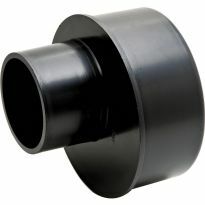 Will the larger fitting work with the DWE7491RS 2.5 O.D. 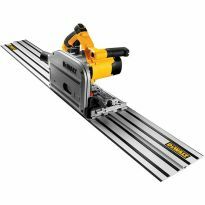 port table saw? BEST ANSWER: No. You will need a larger hose that will accept larger adapters for that. 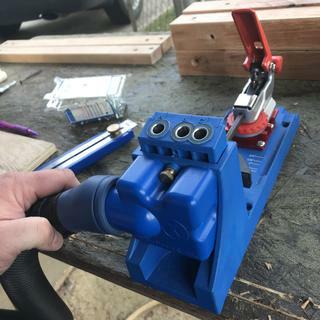 Does it fit the kreg pocket hole jig? will this work with triton 3.5 hp routers ? BEST ANSWER: My triton router the 1.5 hose fits inside the port. This kit is designed to go over the port so it is fit based on an o.d. Not the I.d. Like my triton router base so I would have to say that it is unlikely to work. As heavy as the hose is I am not sure I would want to connect it to my router from a balance issue. Does the 2-1/4 OD end on the Dust Right Universal Small Port Fitting fit inside the flanged end of this fitting? BEST ANSWER: Yes it does. My shop vac has 2-1/4 end that fits inside end opposite flange end. will this fit a rigid model WD4070 shop vac?